The Eastern Cape's Rural Doctor of the Year admits that 'overwhelm' was her constant companion during her first (community service) year at Zithulele Hospital on the poverty-stricken but beautiful Wild Coast. This was in spite of having joined two experienced, dedicated husband and wife couples who had spent years building up a multi-disciplinary team that has since become the envy of rural peers country-wide. She bravely chose to stay with the posting even though a close friend she had applied with was posted to the city. The overwhelm was not unknown to Gatley, who came from a 2007/2008 internship in the heavily AIDS-overcrowded medical wards of the Pietermaritzburg Hospital Complex. Here she witnessed dozens of patients dying monthly after six months or more of waiting in vain for antiretroviral drugs. 'It was really depressing - I remember sitting in OPD at 3am and seeing the millionth person with HIV and TB - you also forget that each person is an individual, so compassion fatigue quickly sets in,' she says. At Zithulele Hospital just one year later, the picture changed entirely, the local ARV clinic having become a place of hope, as had similar clinics nation-wide. Six months now represented the difference between a wasting AIDS patient slumped in a wheelchair and their walking again in close to robust health. 'That's very motivating ... One of the biggest motivators for me is seeing lives change - in fact it was one of that very clinic's counsellors who persuaded me to stay at one difficult stage,' says Gatley, whose postgraduate diploma in HIV - and compassion - have turned her into a much-loved stalwart at the adult and paediatric HIV clinics. She conducts the hospital's monthly paediatric mortality audit and co-ordinates the weekly journal club for the doctors. 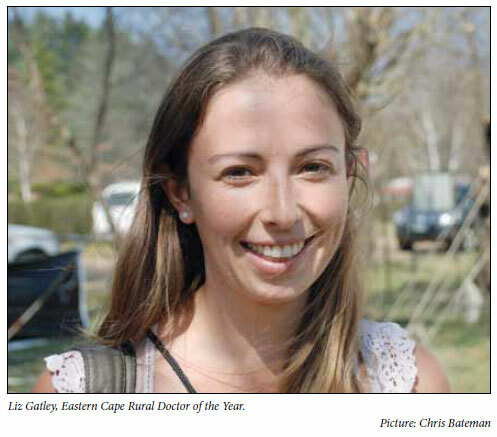 Senior colleague, Karl le Roux, Chairperson of the Rural Doctors Association of Southern African (RuDASA - which initiated the award), says that besides her excellent general clinical skills, going the 'extra mile' for patients, plus her 'incredible memory for them', is what sets Gatley apart. Baking cakes on their birthdays, cooking boerewors for severe burn victims getting insufficient protein from the hospital kitchen, helping with transport money or bringing clothes for Christmas are among her many spontaneous gestures. 'Her ability to see patients as people and treat them with dignity, often crying with them in joy and sorrow, demonstrates what is best about rural family medicine,' reads her RuDASA award citation. Gatley is a University of Cape Town graduate like her mentors, the Gaunts, Ben (clinical manager) and Taryn (parttime child health services and elective student supervisor), and the Le Roux's - Karl (integration of hospital and clinical antenatal care and HIV services) and Sally (part-time ARV provision and HIV care). This solid core of leaders, who have three children each, is supported by six other doctors (including Gatley), most of whom are not going anywhere soon - because of the leadership and supervision. Gatley says had she not done a first-year elective at Zithulele as a medical student, she may never have applied to do her community service there. Illustrating the morale-boosting effect of leadership commitment, she said one of the veteran theatre nurses confessed to her one night that the 'lazy' attitude of nurses changed when it dawned on them that the Gaunts were 'here to stay' (after a succession of short-lived predecessors). 'She said that from that point onward they began to take Ben Gaunt's exhortations seriously,' Gatley reported. You'd think a hospital that has halved its perinatal mortality rate in just six years and provides an unheard-of rural mix of services ranging from dentistry, physiotherapy and dietetics to speech therapy and audiology, deserves a tiny sprinkle of fairy dust. Gatley's future plans include specialising in family medicine and she's banking on at least one speck of fairy dust - the shift to create a programme with a year or two of specialist training in a rural setting, instead of only at a regional or tertiary hospital.